The clip affects the way that data is rendered, both for the density (coloured) displays, as well as wiggles. To the right of the colourbar are the minimum and maximum clip. 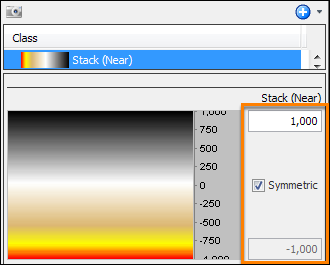 Select Symmetric to enforce a symmetric range for the colourbar. In the example shown, values below -1,000 will be red, values above +1,000 will be black, and values in between will be evenly distributed over the remainder of the colourbar. When displaying wiggles with this example, a value of +/-1,000 would be the full extent of the wiggle. Tip: You can also use the F5 and F6 hotkeys to make the view "hotter" or "cooler" respectively.